As you can see from the title of this article, we will not be discussing the famous four singers and their fantastic song collection but that of Liverpool football club whom really are one of the premier clubs in world football. We have written several articles before on soccer and football and as this is my favourite sport I will write another. Being in Minneapolis, this is home to one of the biggest supporters club of Liverpool in the world. The games are watched by no fewer than 100 people and they even call themselves the MinneKop which refers to the section in the stadium most famous for the flags and atmosphere it generates. 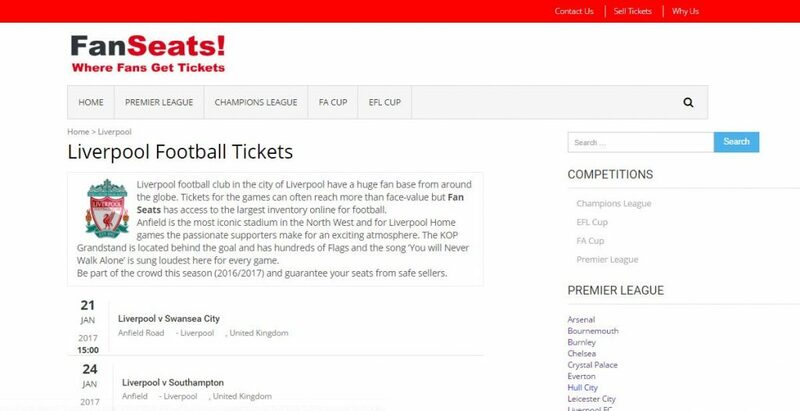 Ordering Liverpool tickets from FanSeats was a good experience and one in which I do fully recommend especially from those international visitors and UK residents. Due to the nature of Anfield, tickets were collected just a short distance from the stadium and collected back again at the end of the match. Whilst we didn’t get a souvenir for the game in terms of the ticket we did get to purchase many other items in the Megastore before the game. We had a fantastic experience and do fully recommend FanSeats.co.uk for the match day entrance. The game finished with Liverpool winning clearly with the best team at Anfield in many years in my opinion. With Klopp a real idol now at the club and a passion not seen for many years we are truly excited by the possibilities of trophies in the stadium. Our aim is to return to Anfield stadium once again before the end of the season and with the team playing fantastic football we do expect ticket prices to be higher than usual, however we are ready to pay this increase. Remember LFC have not won the league in over 24 years and therefore if we win it soon, we want to be there, no matter the cost or expense. Another game we do want to watch is an FA Cup match involving Liverpool and another top team, I was raised watching this competition and every year I remember getting excited for the game at Wembley, no matter the teams. The EFL Final is always a big occasion but nothing compares to his.